Modified 10.10.2009: Small update for compatibility with the script Narrowing list form to one column. 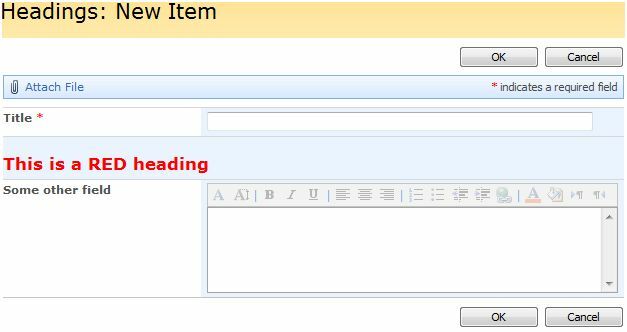 This script adds heading-support to a custom SharePoint List by using a “prefix” in the field name of a standard “Single line of text” field, and a script to search all column names and reformat it as a heading in NewForm, DispForm and EditForm. Create the “headings” by adding a column of type “Single line of text” to your list – and prefix your heading with #H# in the column name like this #H#ThisIsMyHeading. You specify the font size in pixes like this #H#17#ThisIsMyHeading, and you can add a custom color to the heading by adding a hex-color code like this #H#17#FF0000#ThisIsMyHeading. /* Headings from "Single line of text"
to prevent long field names to distort the column width. Note: To use with the script "Narrowing list form to one column", you must set the parameter "stretch" to false. You must also call this script before the "Narrowing list form to one column-script". $(this).attr('width',divWidth); // Width of all "td.ms-formlabel"
Save this as a text file and rename to “HeadingsInSharePointLists.js”, then upload to the library as shown above. divWidth: The width of the “label” colomn – where the fieldname is found. This script removes the nobr-tag from the label to prevent long field names to distort the column width. A follow-up on this article describing how to add heading-support to a list view is found here. I need some help in this script, since I am not a programer I don’t know how to refer the jquery libray into my CEWP. You can refer it directly fom jquery.com, or you can upload it to a document library or you can use SharePoint designer to create a “script-folder” and put it there. Don’t be afrid to ask again if you still have trouble. I have updated the post with some more instructions. When copying the script source, check that there is no “text wrapping” of the source. None of the “long lines” with code must be “broken”. I did, but stupid me, forgot to move the script to below the listfrom. Working perfectly now . this functionality is something close to what I have been trying to figureout. the choice field with check boxes or the radio button selected return a long list of items. Is there a way to change the direction like in HTML where you can do row and columns. a list of 20 items can be formatted into 4 or 5 columns with several items in each. I’m trying to work this into my site but I’m having trouble. I am enough of a non-code guy to not know how to mix the two above codes together. I am starting by inserting this into a NewForm.aspx. Can you help? If you get a message box on the screen – jQuery is loaded – if you get an error like “‘$’ undefiened”, it is not loaded. Sorry to be a drag but in the 1st script when you say, “Put the showHeadings-script here…”, do you mean that I should insert the 2nd script into the 1st script that appears above? I’m unclear how the two scripts above should be combined. The first codeblock is the contents of the CEWP you put in NewForm.aspx, DispForm.aspx or EditForm.aspx. If you plan to use it only in this page, you can insert the full “showHeadings”-script after this line. Thanks for this fantastic find… It Works! This adds a whole new dimension to SharePoint. @Alexander, I know your busy. I had another thought. With this script is there a way to make the heading clickable so it can collapse/expand the fields below each heading? 1st: I just wanted to tell you how much this “tweak” helps my project! Thanks again! 2nd: Is there a way to give the header background a color? 3rd: Can this adapted to a View of a List? I have a draft on a post regarding expand/collapse that i have not finished. I will try to find time to post it – maybe this weekend. After reading this post, i think you would be able to do what you are asking for. Regarding your question on adapting to list view, i am not sure what you want to achieve – can you clarify? Now that I have the headers all formatted on the forms, I would love to be able to set up several List views so that the Headers appear the same as on the forms, instead of appearing as “#h#24#This is a header”. You would then need to add a script to your list view to search for a tag containing #H#… and use the same method as in this script to change the heading. Maybe i can try to make an example later… I will post it if i make it! See if you can adapt it to your need. By any chance can this script be used to create the equivalent to an HTML line such as ? I work for Mark Miller at EndUserSharePoint.com. I read this article and thought it was a really cool solution. As you see i have updated and rewritten the post. I would be glad to “spread the word” at EndUserSharePoint.com. Once again, I know you’re busy… might you have had a chance to study how to search in a List View for the #h# prefixes in order to format them as headers too? Yes you can – just include a link back to this blog. Looks like a great script and is exactly what i’m after but i just cannot get it working in the CEWP. I’ve uploaded all the files and everything but when i add the CEWP script nothing happens – my column name stays as a single line of text with #H# infront of the title. I’m sure this is something stupid and small i’ve missed but i’m pulling my hair out, any help would much much apprecaited! This should give an alert with a few lines of text (a function) if the script is referred correctly. Thanks for your replies: i have the script working now and its exactly what I needed. I hadn’t created the subsites /test/english from the root directory. So i was referencing the script wrong. Thanks again: its a great script! I’m unsure why it is making a difference from pc to pc, as everyone is using the same browser, server etc. I have added another method here: Headings for SharePoint forms – another method. Are there permission settings to consider on SharePoint for this script to run? Apologies, i am using #H# but the code only seems to work for users with administrative priveleges. Then i would advise you to check the privileges for your script library. If the users does not have read access to the script, the code will not work. Also check out the new heading script i linked to above. Thankyou Alexander, that did the trick. Hi Alexander. The script is working beautifully, but I don’t want to “squish” the form. How can I remove the width limitation? Did you put it in to check if jQuery is loaded? I am not able to add a heading using the scripts above. I see #H#13#Heading in new entry form. of my site and changed the path accordingly in the scripts. Could this be the reason I do not see the heading? Just wanted to say thanks for this solution. I have been using it for a long time in SharePoint 2007. I was wondering if you have an updated version of this that works with SharePoint 2013? I hope so since this has been just awesome for easier form field separation. This looks great however struggling to make it work in latest version of Sharepoint. I believe I have linked the jquery scripts correctly as the alert pops up. However as soon as I add the showHeadings(190,true,false,true,’#ebf3ff’); code it fails. Any tips on how to troubleshoot? Much appreciated. The article is nearly 6 years old, and this solution has not been tested with SP2013. You should look at DFFS: https://spjsblog.com/dffs/ in stead. Hi – I am interested in implementing this to my SP site. I would like the heading to be toward the bottom of the list, below most of my fields, but above others. Will this script work for this situation? Also where in the Script is the heading text variable (“This is a RED Heading”) where I can change this for my purpose? Thanks! This solution is old, and I have not tested it recently.